A historical hotel that represents vintage California, the Langham Hotel Pasadena used to be called The Huntington Hotel. Surrounded by 23 acres of incredibly beautiful grounds, this luxury hotel knows service and style with incredible attitude–sophistication without snobbery. It is well understood that this hotel is the place to go for first class. 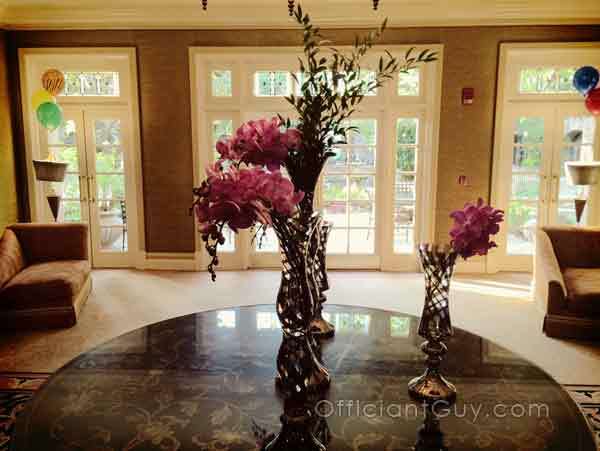 Officiant Guy has officiated every kind of wedding at the Langham Hotel Pasadena from a small, private wedding in one the Langham’s luxury suites to a large wedding in their lush Japanese Garden to a garden wedding on their immense lawn. The wedding coordinators are very detailed and make sure that your marriage ceremony is memorable and stress-free. The lobby at Langham Hotel Pasadena. On the way to the Japanese Garden at Langham Hotel Pasadena. A part of the Japanese Garden at the Langham Hotel Pasadena.